The construction process is an extension of our design process ensuring clients wishes are brought through creatively to completion. All our projects are expertly built, utilising handcrafted techniques and landscaping experience to deliver Nature Spaces that meet and go beyond Australian Standards and Playground safety requirements. NBP projects cater for small through to larger designs, with a range of construction options. Construction of Nature Based Play projects is predominately completed onsite by our experienced staff, with pre-fabrication of Nature Play pieces completed in our workshop, handcrafted by our skilled timber artists. We are also able to build and install pre-fabricated elements. We specialise in coming to rural and remote communities and working with you to realise your nature based adventure area. We construct Nature Based projects for rural and remote communities, with our core team travelling to regional areas working with the local community to complete construction. Remote projects are supported by pre-fabrication of most elements, minimising onsite installation and construction. Our pieces can also be ordered, delivered and installed in remote areas. A service we also provide at NBP is to facilitate and support community involvement in the construction of our Nature Spaces if client desired and appropriate. This takes the form of facilitating community volunteer involvement, and utilising local donated materials and supplies. Our staff are experienced in supervising busy bees and simple landscaping tasks such as assembling cubbies, planting, mulching, laying sand and borders, and painting. This is done in an organised and deliberate fashion to ensure safety and quality standards are met, encouraging involvement from local community members. 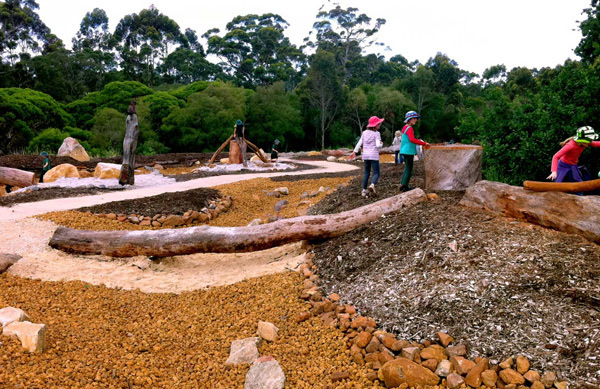 We can utilise suitable donated materials into our Nature Scapes construction, including timber logs, mulch, community crafted pieces, artworks, rocks and other landscaping supplies. It’s important that these materials meet our high-quality standards, and that they are appropriate to the design. The benefits of this to the client is that it involves the local community in the project, providing real ‘community ownership’, and allows for potential cost savings through donated time, materials and effort. 1st week after completion: Play Space Induction for clients – a quick induction on how to get the most out of the playgrounds and supporting risk management for teachers/carers/local community. 1 month: Maintenance Revisit: Come back and review any early maintenance requirements in the Nature Space, ensuring all is to standard. 1 Yr: Design and Maintenance Review: NBP will come back to speak with clients on the ongoing maintenance and possible design updates and inclusions to maximise the Nature Space play and learning opportunities. NBP is equipped to work with other landscape design and construction companies to build and install Nature Play Spaces within Community Landscape areas. Working with Landscape Concept and Design Plans we can ensure the specified Nature Play areas are detailed and constructed to highest levels, adding our own handcrafted pieces and concepts to the final design.